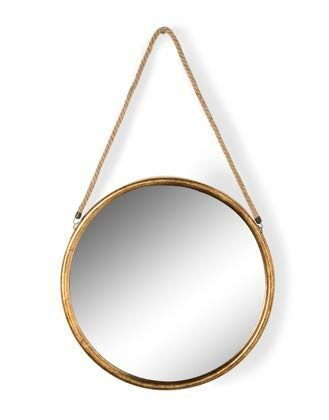 This beautiful simple but stylish large round gold mirror on rope is a sublime choice to decorate your home. This large mirror is beautifully textured, its thick metal frame has an antique gold finish, combine this with the hanging rope and you have a versatile mirror that would easily blend into any minimalist, vintage or contemporary decor, the clever combinations of metal and rope work beautifully to create an on trend feel. The mirrored glass is great at projecting light around your room and will create the illusion of increased space. The round metal mirror would make a warming luxurious feature on a plain painted wall allowing the mirror to truly shine, or in a downstairs toilet, or why not feature this mirror above a console table, alongside other decorative items creating a stunning feature. Available in different sizes so why not hang all of them above a hall table to make a real feature! Measures 58 x 58 x 2.8cm (plus rope) (53.5 x 53.5cm glass) Please do take a look around our on-line store as there are hundreds more wonderful items to be seen. If this large round gold mirror on rope is not the one you are looking for, we have many many more chandeliers, sconces, table lamps, floor lamps, wall lamps and other lighting items. Our lavish selection of gifts, mirrors, french furniture, lamps, chandeliers and vintage style home accessories will inspire you. Updating a bedroom perhaps? Starting afresh in an exciting new home? Revamping a living room? Or simply adding refreshing feature accents to your lovely home, we are your one stop vintage shop! I’m here to help so please do feel free to contact me with any queries you may have.